A couple of con men, but I think I’d take the Mafia dude over Chaffee in an election. The mob gets it done. Doug Chaffee is senile and no longer self-aware. The contrast between these speakers is stark. It looks like Chaffee is bringing in the heavy hitters to get the Coyote Hills development across the finish line. Smart. Shouldn’t that guy be in jail? Doesn’t say he ever paid for all that “illegitimate” business behind bars. Murder, extortion, racketeering, kidnapping. But he’s reeeeeeaaal sorry. Chaffee is just a garden variety liar and pimp. Mikey “Deep Freeze” should move to Fullerton and run for city council. The city would actually be very well run, ’cause it couldn’t get any worse, right? It looks like Mikey Deepfreezer is monetizing his criminal life. Where’s the “redemption” and what sort of knuckleheads booked this act? Redemption and forgiveness start in the penitentiary, Mike. There is no redemption for Chaffee, who would sell out his own mother to get into office. 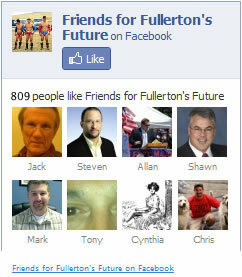 I would like to know how a Martian came to be Mayor of Fullerton. Must be Mexican Mafia connections too. Barry is going to miss the Vegas (official police business) trips. And he lives on Coronado Island according to the dry cleaners he uses. i heard this speaker at the La Habra Mayors prayer breakfast. I believe the tickets for the breakfast were 15- 20 dollars which covered a very breakfast. 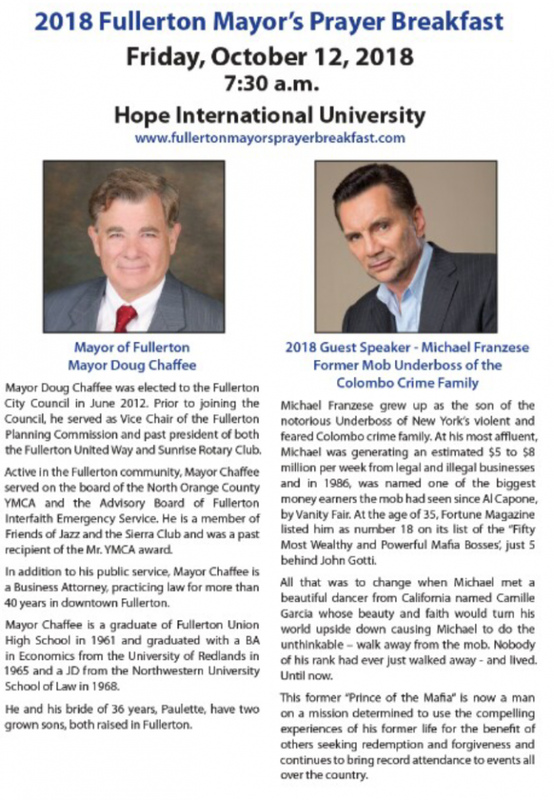 I noticed the price is about twice that at the Fullerton Mayor prayer breakfast with a higher cost for preferred seating with the Mayor’s circle. To me the pricing and favored seating discourages the overall purpose which is prayer and felloship with others of the faith based community. I think it best to accept monetary contributions instead of raising money through inflated ticket prices. A prayer breakfast, in my opinion, should not discourage people from lower income levels from attending.